Play 35 new levels designed by fans of Frozen Fruits. 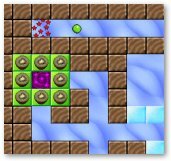 This is the sequel to the classic Frozen Fruits game with 35 new levels created by fans of the first part. Once more it's your mission to enter 35 storage rooms through tubes and bust all fruit bricks in there. Quick reflexes and logical thinking are required to master the task. Click on the button to download and install the game. The game is 100% safe and free of spyware or adware.